Worldwide Holdings Berhad is currently in the process of developing an Integrated Solid Waste Management Centre (ISWMC) in Jeram, Selangor. It will include a waste-to-energy (WtE) plant, composting plant, material recovery facility (MRF), anaerobic digestion plant and a research and development facility. Contracts were signed for the WtE plant this month and development will take place across two phases. The project is expected to be completed in 2025. Ever Ecove, a special purpose company established between Evergreen Steel Corporation and CTCI Group, has been awarded a build-operate-transfer contract for a new WtE facility in Taoyuan. Nippon Steel & Sumikin Engineering and Steinmüller Babcock will also be working on the project. Commissioning is due to take place in summer 2021. Groundbreaking is expected to take place on the site of a new combined heat and power (CHP) plant in Grangemouth, Scotland, after strategic development partners, Covanta and Green Investment Group, reached financial close. Pori Energia is in the process of building a new 20 MW biomass plant at its Aittaluoto power station, which will reduce carbon dioxide emissions by 88,000 tonnes each year. Originally constructed in 1968, the facility produces enough energy to cover almost half of district heating for the Pori and Ulvila networks. The City of Red Wing, MN, is investing US$12.54 million to improve its solid waste campus operations. Works will cover the development of an integrated solid waste management system, including a refuse-derived fuel (RDF) facility and an incinerator building. 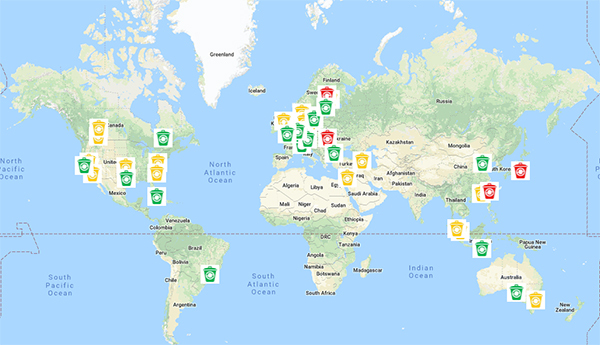 In the week ending 14th December 2018, AcuComm added 20 new projects and updated 29 in our database. These have a combined estimated value of US$5,896 million. There are now 5,583 active projects in the AcuComm database, worth an estimated US$362.5 billion. 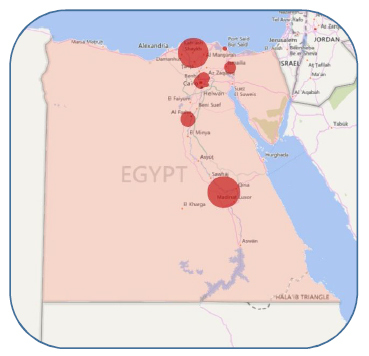 The focus is on Egypt for our latest Global Waste Investment Fact File, where we cover 9 waste projects worth an estimated US$570 million. Recycling is the leading project type, accounting for US$230 million or 40% of the total. This is followed by incineration (with energy recovery), accounting for US$141 million or 25% of the total. The total estimated capacity of these projects in 1.7 million tonnes. 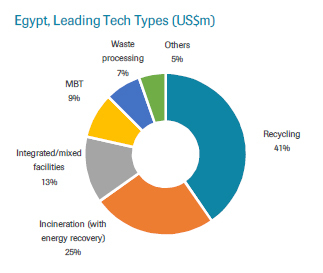 This is equal to 194,065 tonnes per project on average and 8% of Egypt’s annual waste generation. Waste investments totalling US$371 million are expected to become operational over the next few years. This is currently expected to peak in 2020 at US$230 million. Explore our full list of projects in Egypt. Fjernvarme Horsens has advised AcuComm that no decisions have been made regarding the replacement of two boilers at its waste-to-energy (WtE) facility in Mydtjylland. The Municipality of Zavidovici has requested the support of the European Bank for Reconstruction and Development (EBRD) as part of a new project. Currently at the feasibility stage, the project will involve the rehabilitation of the closed solid waste landfill, construction of a transfer station, improvements to district heating facilities and expansion of the water distribution system. It is expected to cost around €8.1 million. Yorkshire Water is developing a new regional sludge treatment facility in Upper Brighouse that will use anaerobic digestion technology to produce biogas. It will have the capacity to treat up to 16,500 tonnes of sludge each year and will replace the Calder Valley incinerator. Construction works are underway and expected to be complete in May 2021. Doosan Lentjes has revealed that it will be supplying its circulating fluidised boiler (CFB) technology for a wood-fuelled biomass power plant in Sodegaura, Chiba Prefecture. Varmalämmitys has signed an agreement to construct a biomass boiler plant in Kälviä. The facility, which will be operated by Kokkolan Energia, will produce heat energy from locally-sourced wood-based feedstock. Today’s Full Access Project will only be available to access for 7 days, so make sure you don’t miss out! Find out more.